The day of work at Mustang Maniac couldn’t come round quick enough for me, clock watching only seemed to make the time go slower. Why was I more eager this week than previously? The simple answer is that I would be working on my freshly painted new shell fitting new parts. I wasn’t sure exactly what I would be doing as that was down to Yogi to let me know. I arrived at the offices early to find Yogi with a fancy wipe clean Snap On board with a list of parts on it. We had our usual chat and listened to the conversation taking place. The list was new parts for my car and I was asked about what I wanted to do with the car stance. More of that a bit later. The important parts were going to be the upper and lower control arms which as the name suggests controls the efficiency and operation of the suspension. Old worn parts here could cause problems when it goes to the Geo Workshop later for tracking, camber and toe set ups. New parts it was to be especially around the suspension and steering. I walked into Al’s (Yogi’s) workshop and there was car still covered and looking very peaceful under her cover. I was informed that the fuel line has been fitted first as it’s a major pain to fit after the parts are fitted. The line hasn’t been fastened properly yet as the brake lines will need to go on as well at the same clips, but you get the idea anyway. We discussed the plan of action and what we were going to do, shortly after we planned the day the parts turned up fresh from Mustang Maniacs stores. The first job was to lift the car of the trolley, This was done via large axle stands and a large lengths of wood that would be supported under the car. The ramp was lowered until the strain was taken up, slowly the clamp bolts were undone and the trolley lifted away. The supporting blocks of rubber were mounted onto the ramps and another milestone was reached. No photo’s at this point as it was all hands to each corner and simultaneous actions required to prevent damage. This can be done in front and back but takes a while. A celebratory smile from myself was brighter than the sun that just started to show through the clouds. 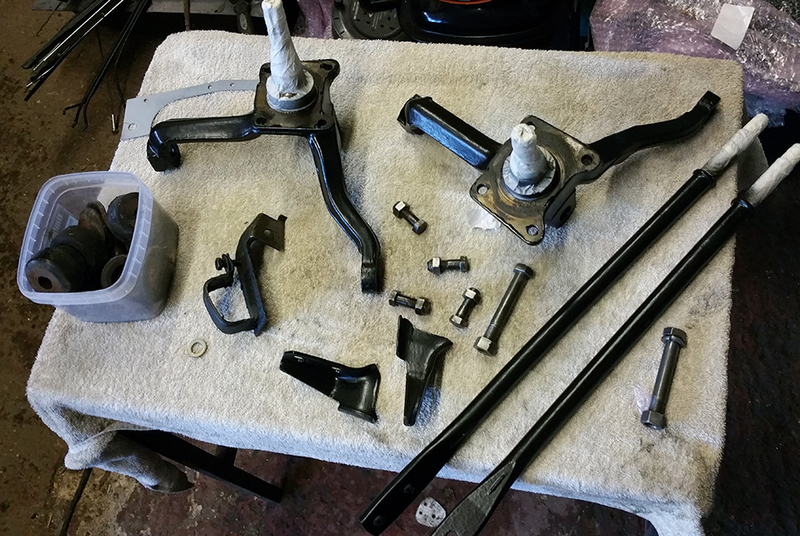 We (being Yogi and me), got a work table out and unwrapped by refurbished spindles, tie rods and their relevant bolts. Things were getting really exciting. 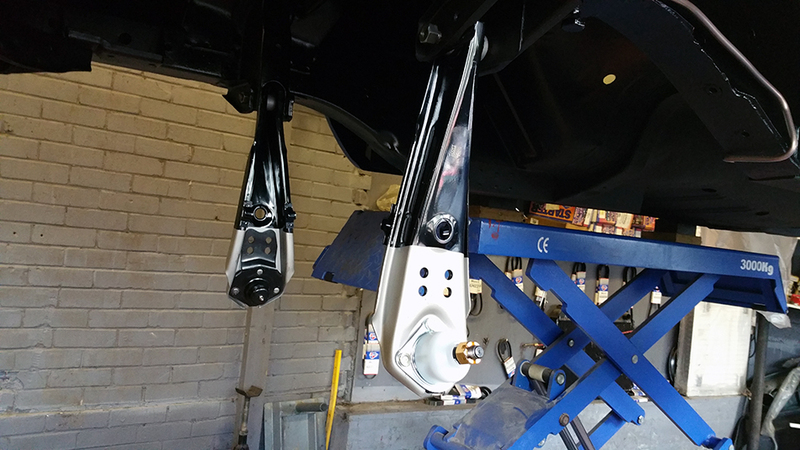 The bottom control arms were fitted into place via the single heavy bolt and left to dangle, these were the first parts to be bolted back onto the car and I couldn’t believe that I was actually doing it. Yogi was prepping the bits showing me what to do and then letting me get on with it. I learned a little saying that is so true: “Finger tight, until you know it’s right.” This was the order of the day that allows you to move things around to fit should you need too. The top control arms were fitted into the inner wing mounts and the spindles bolted into place. This joined up the two control arms. The Tie rods were next to be bolted into place which linked the control arms to the front of the chassis. We decided it was time to bring in the axle over from the panel shop where I had been working for the previous couple of weeks. The main axle shaft was black and the diff painted to the original Red Oxide primer colour scheme as it would have been straight from the factory. The stainless steel shackles for the leaf springs were mounted to the rear chassis legs. The front of the leaf springs were lifted into place and lightly bolted lightly into place, the rear bushes were fitted into the chassis legs and the back of the of the leaf springs also lifted up into place, a little joggling around to get the bolts aligned through the holes to hold it all in place. What followed was a complicated procedure of resting the axle on a support and lifting one side over the leaf springs to be seated correctly on the top of the leaf springs locating lug. The shock mounting plates were then clamped to the leaf springs and axle via the large U-bolts and tightened up, hard. The rest of the rear suspension bolts were now tightened up as well. After lunch it was back to the front again, we were going to fit up the new spring perches that were a couple of bolts onto the lower control arm. The uprated 1″ anti-roll bar will make a big difference to the handling of the car as well as the Export brace and Monte Carlo bars that will be fitted. Due to the size of the anti-roll bar this now runs very close to the tie rods and is a two-man job to fit with damaging any paintwork on components. The anti roll bar U-clamps were put into place to hold the bar and then the bottom mounting arms and bushing fitted to the lower control arms. Once we were happy with the alignment we bolted it up properly. During this point of fitting the anti-roll bar bushing kit I had a couple of the rubbers in my hand and noticed they were different. I started to panic having a senior moment thinking that I had fitted the wrong parts somewhere. I held my hand out to Yogi with the parts to show him the different parts. He looked at them, turned one over and it was of course the same, simultaneously he laughing out “doughnut”. A few minutes of laughing followed with me saying “I can assume that this will not be mentioned outside these walls then”. To which Yogi laughed back with “not if you mention that you are a doughnut in the first paragraph of your blog!” I agreed. But, as I have called myself a doughnut and ‘fessed up to my school boy error, I needn’t of mentioned it earlier, does that make me a double doughnut? But it was worth it and I thoroughly enjoyed the banter. The final quick job rather than the fitting the front springs and shocks was to hook up the hand brake cables to the tunnel brackets so that they didn’t get in the way. It was a great day, and I loved every minute of it, thanks to the MM guys. 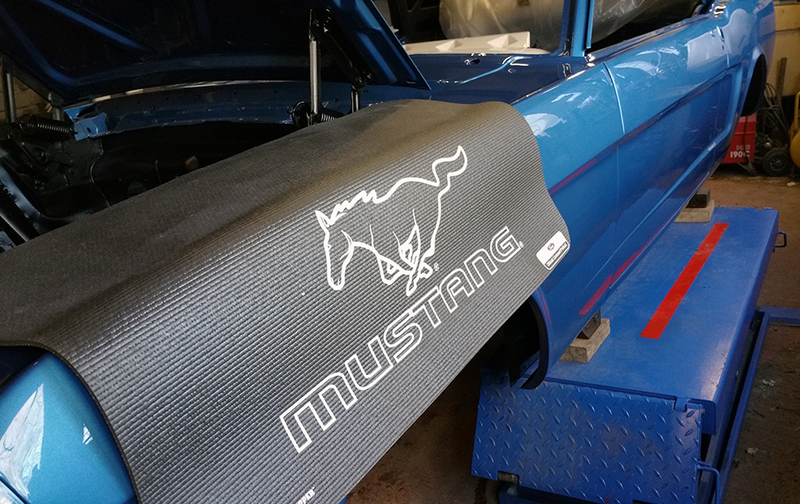 This entry was posted in Car, Photo's and tagged axle, control arms, hand brake, leaf springs, Mustang, Mustang Mniac, Mustang ride height, One man and his Mustang, paint job, Red Oxide, Spindles, spring perches, suspension, Tie Rods, wife, Yogi. Bookmark the permalink. Thank you Debbie, you’re right the guys are amazing and show me how to do it properly and you can’t buy that in a book. The boys had their eyes on the fender covers as well, lol. When you’ve got down to fitting new, clean parts, you know you’ve turned the corner; it’s a great feeling (especially if everything fits! ).